Think of PDF Security and most people immediately think of Adobe PDF password protection. But are using passwords really a secure method of protecting PDF files against unauthorized use and misuse? Here we cover the advantages and disadvantages of using passwords to protect PDFs, how to remove passwords from PDF files, and whether passwords are an adequate method of PDF protection. Does PDF Password Protection work? PDF Password Protection has been around for a long time, but is rarely analysed to see how successful it is. Here we look at it in terms of the good, the bad and the ugly. How to get PDF Password protection to work. What you must consider if password protecting PDF files & password strength. Using PDF password protection to stop PDF files from being misused. The options and software available for password protecting PDF files. Permissions you can apply to PDF files, such as preventing access and stopping printing. Tips on setting permissions for PDF files. How to unlock PDF files. The tools available to remove password security and why they are effective at unlocking PDFs. How to select a strong password for your PDF files and apply PDF password protection to documents. A secure password should be at least 8-9 characters in length (preferably 16 characters). It must not comprise any private data —particular one’s actual name, company name or surname. It should not be the same as any previously used passwords. It must not be a single dictionry word . It should comprise of attributes from these four fundamental classes: uppercase letters, lowercase letters, numbers, and special characters such as £%$(, etc. If you follow the basic password protection rules and use strong passwords then your PDF documents should be adequately protected. Bear in mind however that if you give the password to others then they can do what they like with the PDF file. So the password protects other users from opening the PDF document but nothing else. Whilst Adobe employ another type of PDF password, a restrictions password, this can be easily removed by PDF password recovery software. So PDF password protection is really only useful for storing PDF files securely. It is possible to use passwords to protect PDF files from being opened, printed or altered. The Permissions password or master password – lets you alter or remove PDF controls. Users don’t need a password to open the document but they do need a password to change the restrictions you’ve set. If the User password is already known, or the User password was not set, then there are literally hundreds of tools available, some free, some paid for, that will remove the permissions password almost immediately – 82 Million results on Google, so take your pick. So if you are trying to control document usage you have to set a User password on the document or the permissions password can be removed trivially. This creates the obvious problem that the people you are sending protected documents to need to have the User password in order to read it. And once the User password is known users can then use PDF password removal tools (although there are also other simpler methods – see Removing PDF Passwords) to trivially remove the permissions password and do what they like with the document. This is exactly the same weakness with sending encrypted documents that do not have DRM controls – the recipient can do what they like and you have no way of stopping them. So the only time there is some control is if someone (i.e. an unauthorized user) gets hold of a User password protected document, not knowing what the password is. But even here companies such as Elcomsoft, famous for being the first to break the User password system, provide PDF password removal tools to carry out dictionary attacks (common password words such as ‘password’) and ‘brute force’ attacks (which will get you there eventually unless the password is very strong). Are PDF Passwords safe to use? The conclusion you have to come to is that although PDF password protection seems to be a good idea because it’s easy, most implementations are not actually effective. That is fine if you just want to appear to have some security. As an approach it only starts to become practical with very long passwords together with other controls monitoring or preventing unauthorized use. The Adobe PDF Security method has been exposed as having an inherent weakness – based on an ‘honor’ system it relies on third party applications to enforce PDF restrictions (i.e. stop printing or copying). It is therefore trivial to bypasss or remove. This article covers the Adobe PDF security handler in more detail – How the Adobe PDF Security Handler works. There are stronger approaches than passwords to ensure PDF protection. They start with the introduction of a recipient Identifier (ID) as well as a key, and go on to using cryptography to prevent unauthorised use by identifying hardware and linking it to the license rather than trying to identify the end user (identifying the hardware is not the same as identifying the MAC address given in a network adapter which can be changed or masked relatively easily). 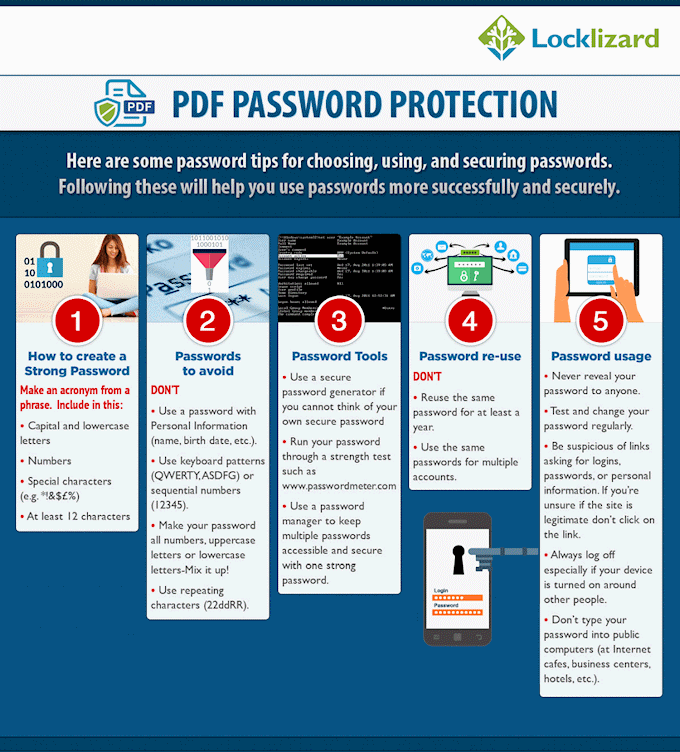 Locklizard for example, protects PDF files without passwords – using keys that are transparently and securely relayed and locked to user devices so they are not exposed to either users or third party applications. We also use other security mechanisms such as encryption, licensing controls, and proprietary protection methods to ensure PDF documents remain protected against unauthorized use and misuse no matter where they reside. See our DRM Technology. PDF Password Protection has been around for a long time but does it work? Here we look at it in terms of the good, the bad and the ugly. Is PDF password protection secure? Most people are of the opinion that PDF password protection helps to keep their PDF data secure. Increasingly, people have become concerned that documents they send out, particularly in PDF format, may be open to re-distribution or misuse. Information on PDF security issues, vulnerabilities, flaws and cracks in Adobe PDF and other PDF Security products.